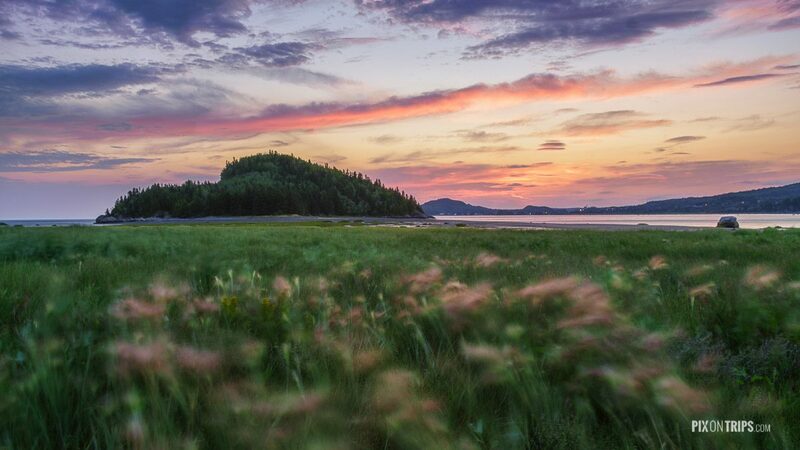 In August we spent two weeks touring the Gaspésie and the Côte-Nord regions of Quebec, Canada. 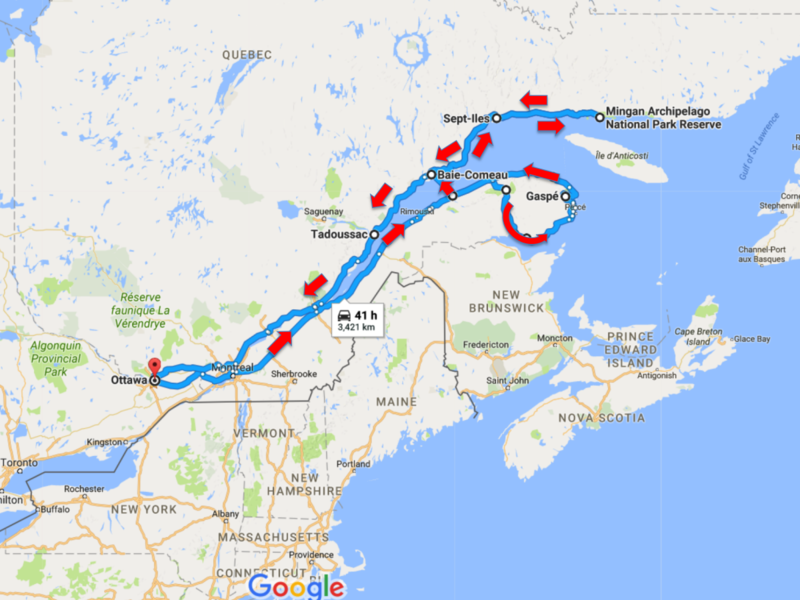 We began driving on the south side of the St. Lawrence River because it would be very hard to find reasonably priced accommodation at Tadoussac at the beginning of August if we were to start from north side. 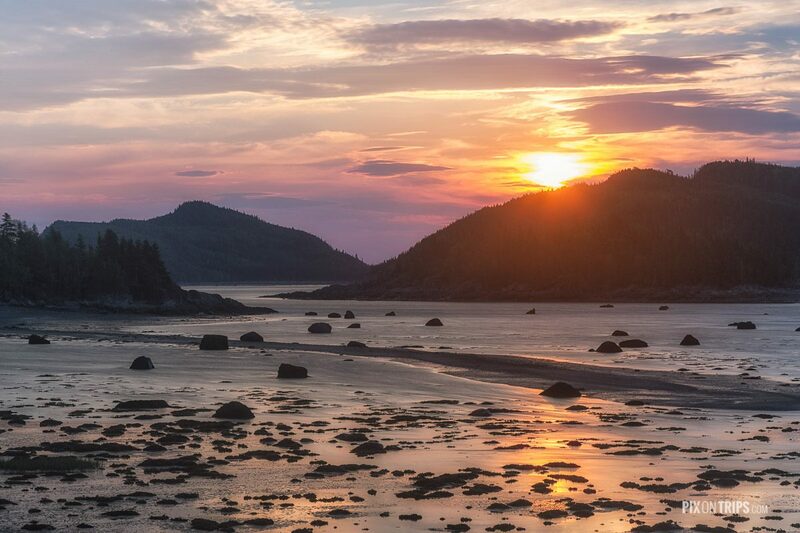 After driving 730Km we arrived at Parc National du Bic. Our camping site was Cormoran #99. Cormoran campground is beside Hwy 132, outside of the gate of the park. I was not bothered by the highway noise after 8 hours driving, but it can be an issue for some people. 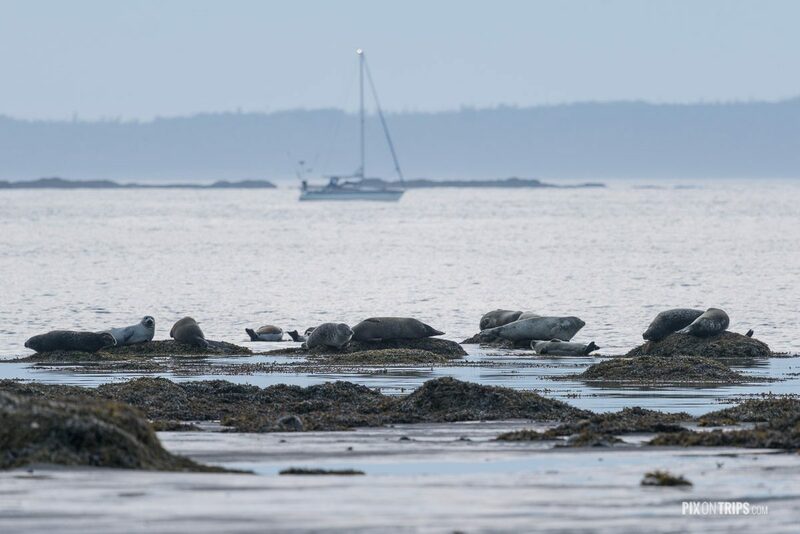 After setting up the tent, off we went to Pointe aux Epinettes, one of the two spots recommended by park staff for seeing seals. It was a short drive to Pointe aux Epinettes. 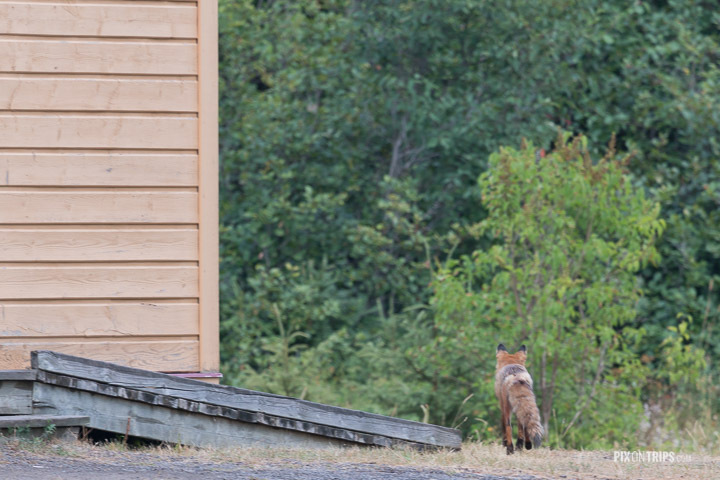 A red fox was approaching us right after we got off the car at the parking lot. I rushed to the trunk to fetch my camera bag. The fox was only a few meters away staring at me when I was unzipping the camera bag. I missed the chance to take a front shot of the fox. No seal was spotted at Pointe aux Epinettes. Off we went to Cap Caribou, which didn’t disappoint us. Sunrise at Bic was at least half hour earlier than in Ottawa. Took the shot below at 5:04AM at Les Anses. It was quite windy. I imaged that the blurry pink flowers would be interesting in the foreground when captured using slow shutter speed. At 5:30AM, I was at the Discovery and Visitor Centre. How could I be more creative? I attached a variable ND filter to an EF24-105mm f/4L lens to capture sunrise beside the ocean. 10-second exposure smooths the ocean surface and makes it look like ice. The soft golden light in the earlier morning is magical. Bay Ha Ha, a very photogenic place in the park looks fabulous. Hope I doesn’t ruin the beauty to include myself. The size and popularity of the park was under appreciated by us during planning. 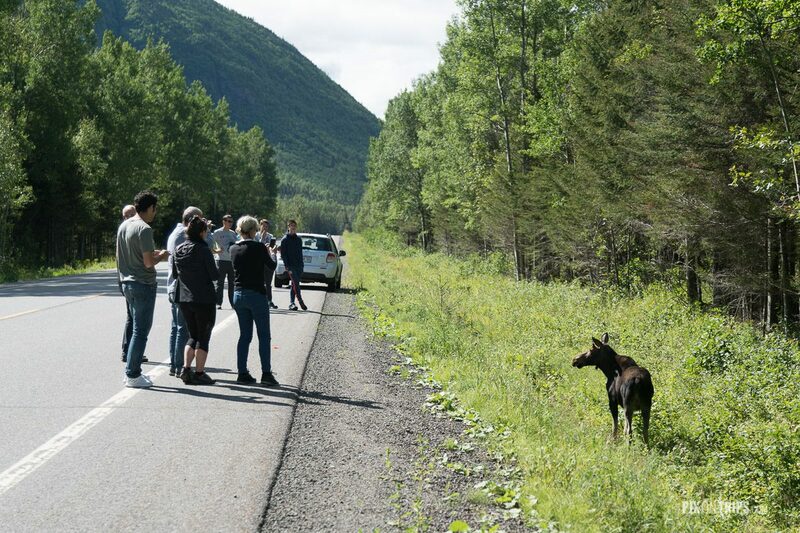 The camping site we chose is located at the Mont Jacques-Cartier section, 40 minutes drive from the visitor centre on unpaved road. En route to our camping site we hiked the Mont. Ernest-Larforce trail. 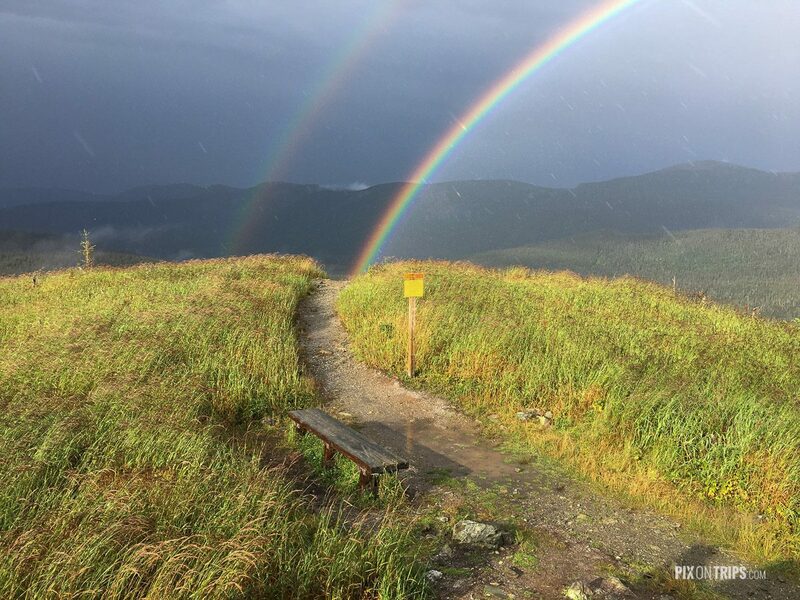 We were rewarded by double rainbows after hiking in down pour to reach the summit of Mont. Ernest-Larforce. The next morning I found a perfect place to fly a drone I borrowed from a friend. Distracted by low battery warning from my iPhone , the drone quickly went out of sight when I shot the footage below. Return to home function did not bring the drone back but instead gave me another warning. Finally, it was the tap to fly feature that saved me from losing the $1500 CAD drone. 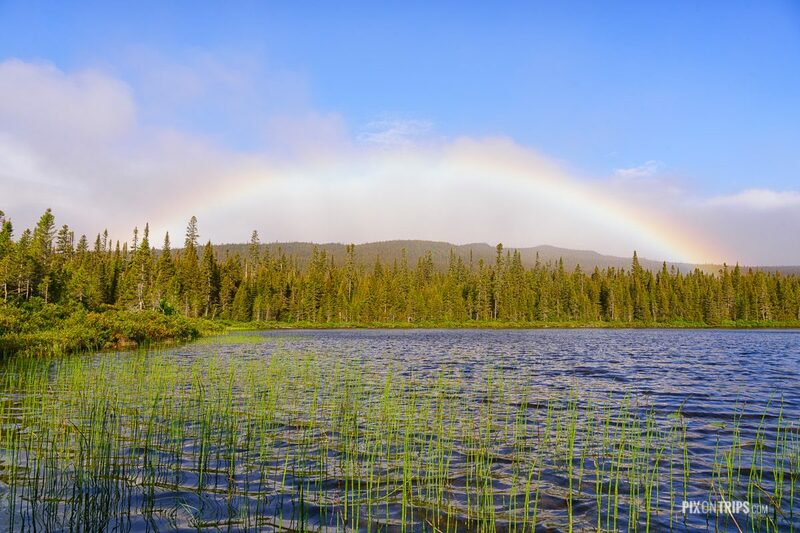 The biggest attraction of the Mont Jacques-Cartier section is woodland caribou. These caribous can only be found at elevations above 900 meters. 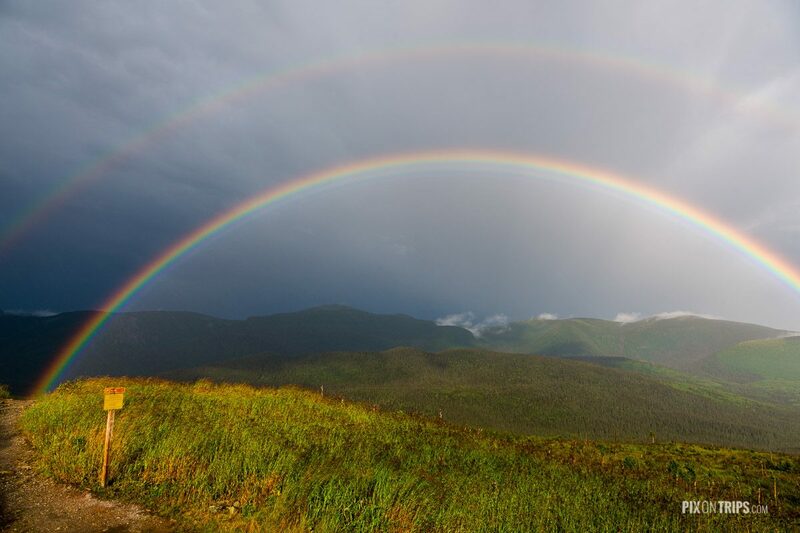 At 1268m, Mont Jacques-Cartier is the highest point in the Chic-Chocs Mountains, and in all of Quebec outside of the remote Torngat Mountains. The subalpine open forests and barren alpine peaks at Mont Jacques-Cartier is home to some 200 caribous. 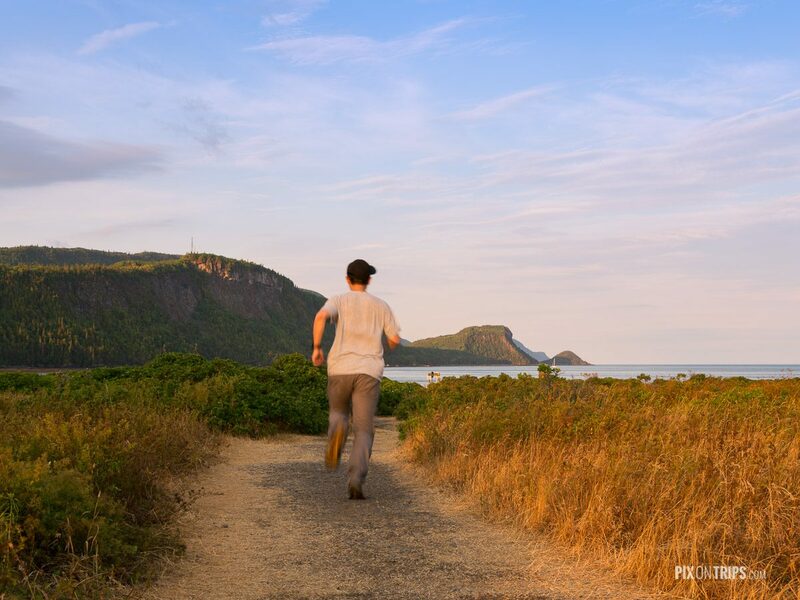 Shuttle is provided from Mont Jacques-Cartier camping ground to the Mont Jacques-Cartier trailhead. The hike from the trailhead to the summit is about 4Km. The video below gives you a good idea how the weather was in mid-August. 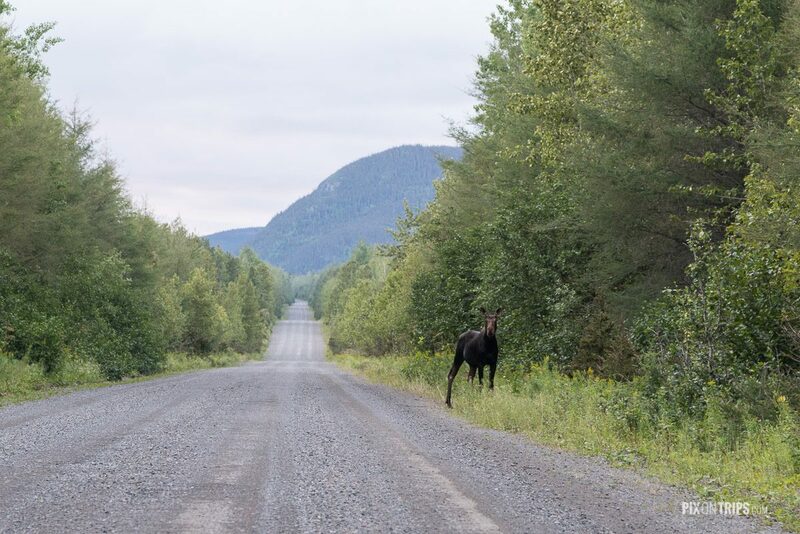 It was not uncommon to run into moose in the park. 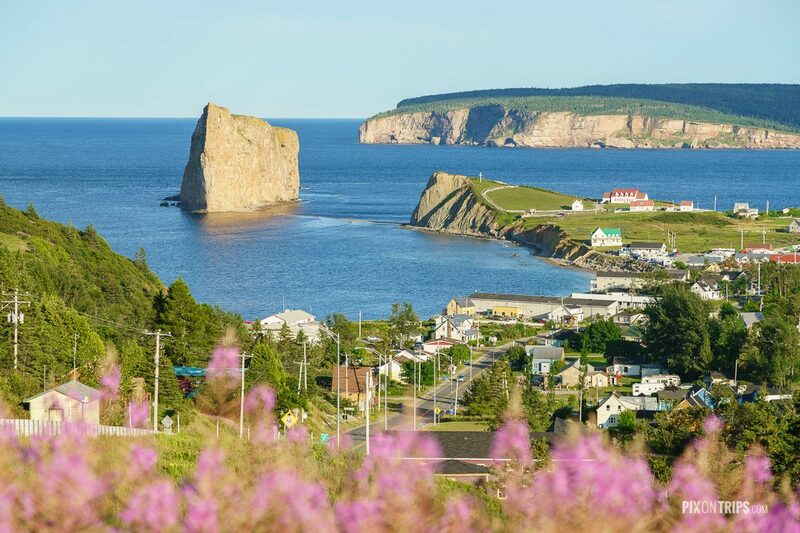 The long and steep uphill located on the north Percé offers magnificent vista of Rock Percé and the town of Percé. It was full moon the night we stayed at Percé. I threw the idea of photographing Rock Percé under moon light and promised wife and son the view would be fantastic. Off we went to a rest area on the south side of the Rock by Route 132, only to realize that it was so dark and the Rock was barely visible even under full moon. I was not discouraged knowing that the modern DSLR sensors have much better sensibility than human eyes. 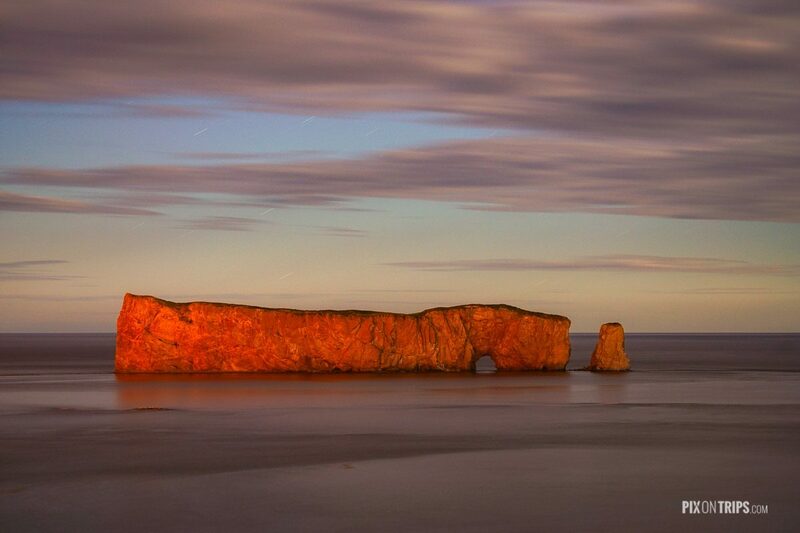 The first long exposure shot of 15 seconds at ISO 1600 revealed the Rock with promising clarity. The test shot also showed that I needed to move to another location to avoid trees in the foreground. There was no difficulty finding a spot with clear view. It took me a few more shots to get focus, composition and exposure satisfactory. Achieving accurate focusing proved to be more challenging than I had expected. I had to focus on a lamp not too far from the left edge of the rock. The photograph below is a result of 106 seconds exposure @f/5.6 and ISO400. ISO400 is a compromise between noise and exposure time. If ISO100 were to be used, the exposure time would have been 424 seconds, or 7 minutes. Any change in lighting (e.g. moon covered by cloud) could potentially ruin an otherwise lovely photo.